Roots Community Health Center is giving formerly incarcerated Californians a fresh start — at home, in the workplace, and for their health. 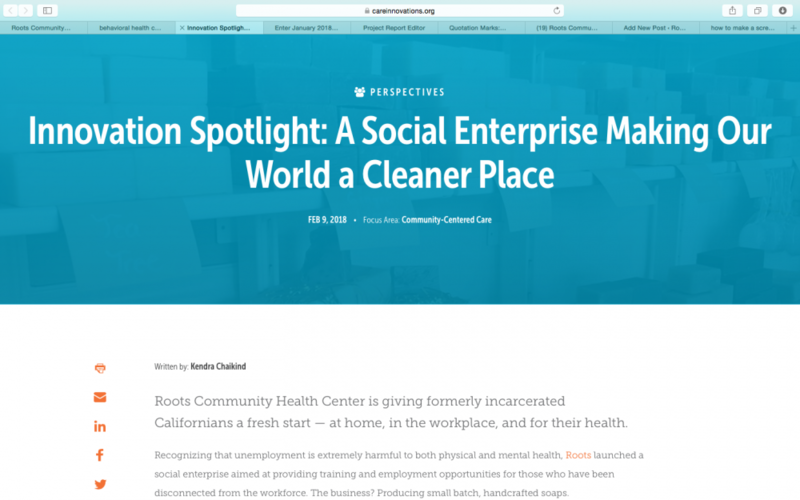 Recognizing that unemployment is extremely harmful to both physical and mental health, Roots launched a social enterprise aimed at providing training and employment opportunities for those who have been disconnected from the workforce. The business? Producing small batch, handcrafted soaps. From its beginnings in 2008, this has meant tackling the community’s No. 1 barrier to wellness: poverty. “The biggest thing that’s keeping people from being healthy is not finding a job,” says Aquil Naji, chief operations officer at Roots. Unemployed workers are way more likely to develop a stress-related condition, such as a stroke, arthritis, or heart attack. There are significantly higher rates of depression among those who have experienced long-term joblessness. The pressure of being unemployed can trigger a wide range of unhealthy behaviors — smoking, drinking, drug abuse, binge eating junk food — and even lead to an increased risk of death. In response, Roots has built a number of workforce initiatives to empower the community. And when it discovered the reentry population was still having a hard time to get a foot in the employment door, Roots created the opportunity itself. Enter the Emancipators Initiative, a program that combines on-the-job training with whole-person support. Former inmates face far more difficulties than the average worker when it comes to landing a job. Criminal records often carry a lifetime stigma. Individuals have been shut out of the workforce for an extended period of time and they lack basic skills to apply for a job. That last component is the cornerstone of the Emancipators Initiative. Roots discovered that light manufacturing, or the production of small consumer goods, was a promising industry for former inmates. There are 260 factory employers in Alameda County alone. Many employ people with criminal backgrounds, and even during the Great Recession, this sector continued to hire scores of workers. The only problem was that potential hires needed on-the-job experience. Once again Roots filled the gap by launching its own social enterprise, an Oakland soap factory called Clean360. Here, Emancipators learn how to make and sell all-natural soap, as well as the necessary skills and training to compete in today’s job market. While soapmaking seems random, it was actually a heavily-researched decision. Roots knew it wanted to manufacture a simple, tangible object that everybody needs. It looked into all the possibilities and it came down to just two products: soap and toilet paper. But Roots leadership also knew it had to be a product that could inspire. They knew it had to be something healthy and natural, something that makes people feel good. Soap won out. In 2013, Alameda County Social Services Agency allocated $696,000 for the health center’s pilot project, which helped pay for the factory, Emancipator wages, and soapmaking school. Under the tutelage of a master soapmaker, Emancipators studied saponification, the primary chemical reaction of soapmaking. They learned about different kinds of fats and oils, as well as the necessary ratios of lye needed to transform them into bars of soap. The founding Emancipators team soon began producing soap on special order for local small businesses. Their very first product was Cotton Clouds, a 6-ounce bar of soap made out of avocado, coconut, olive, and palm oils. Unlike most commercial soap, this bar is “superfatted,” meaning it’s more emollient and moisturizing. Today, 100 percent of proceeds from Clean360 products go back to growing and sustaining the Emancipators Initiative. Emancipators have formulated and developed dozens of new soap varieties, such as Saffron Citrus, Blooming Rose, Floral Sunrise, and Peaches and Cream. They’re now expanding into bath bombs and shower gels. Newly released inmates continue to find work at Clean360, earning $13.50 an hour for 40 hours a week. The health clinic has found the factory is a critical transition workplace, as many need to adjust their schedules to going to work every day. Clean360 gives workers the flexibility to go to the doctor or see their probation officers without worrying about having their pay docked. Workers also know it’s a place where they are treated with dignity and respect. For example, parole officers can’t just knock on the door of the factory; they must call ahead. Clean360 has opened two retail storefronts in Oakland, at the factory and Roots’ main health clinic, where passersby can shop for soap. It has also expanded into Southern California with another factory and store in Inglewood. At the same time, Roots is advocating for responsible procurement. Aboelata and Naji argue that if a public hospital, for instance, already has a budget to buy soap, it should spend a little bit more to buy products made by members of the community.